I will try to get some better shots. 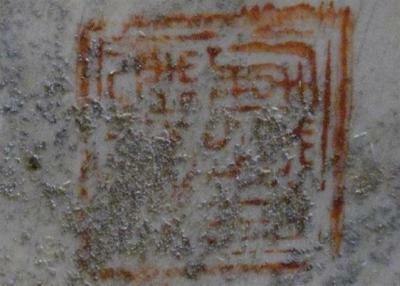 The mark is only partially visible, but in 90% of the cases of this type of mark it is a spurious Qianlong mark. A real one doesn't look that way. These marks are always irrelevant to the item's age. 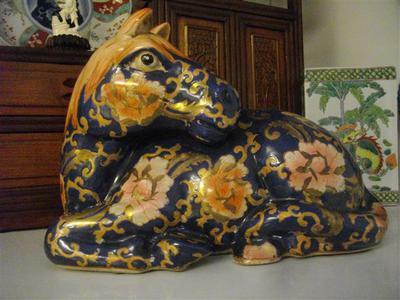 Don't get deceived by the dirty bottom, the horse looks as if it was "baked" only yesterday. 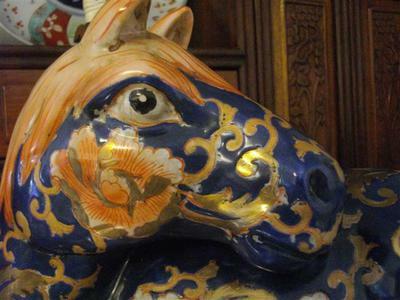 Horses were depicted differently in ancient times. This realist shape is 20th century. The colors are rather late 20th century, in my view. This is the best picture I can get of the mark. The stains will not come off to give a better image. It measures, 12" long, 6" wide and 9" tall.